Get access to all of Phil’s stats he uses week in and out. Subscribers will also get access to our FBS, FCS and NFL Team pages for the 2019 Season thru the Superbowl. Subscription starts June 1st 2019. Ends February 29th 2020. 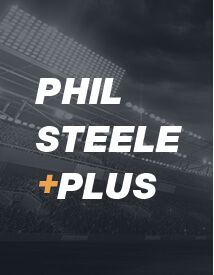 *Purchase any subscription of Inside the Pressbox and get Phil Steele Plus Free!! Email customerservice@philsteele.com if you are a current Inside the Pressbox customer.